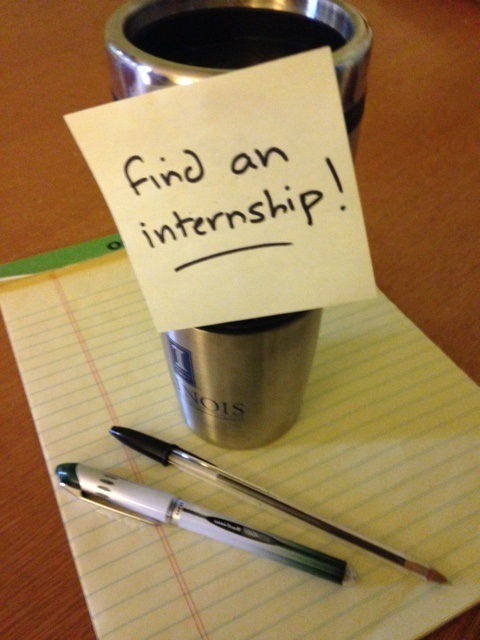 It’s not too early to start thinking about spring or summer internships. Spring semester internships are starting to get advertised on the Internships page of this website. Use the “Advanced Search” button, but DO NOT type anything into the search bar. Though it’s the most prominent, ignore the “Job Function” menu. Use the “Industry” menu to search within fields that interest you. Once you’re logged into I-Link you’ll be able to see the positions curated by LAS for its majors. An additional source for finding internships specifically with not-for-profit organizations is idealist.org. Is there a particular company or organization you dream of working with? Check their website–they may offer internships. Yes, if you want to be employed after graduation, you need to network. Sometimes that involves informational interviewing. Yes, it can be awkward, in EXACTLY the ways this article describes. How to make it NOT horrible? Have a plan. No one is going to be more invested in your success than you are. Know what you want to know. The key is the word “informational.” If you don’t actually to to learn anything this person can tell you, then why set up the meeting? If seeking information is a pretext to form a relationship with this person and get him or her interested in your success, then admit that to yourself and figure out a strategy for creating that relationship. Research, research, research. People love to talk about themselves. Make it easy for them to do that by knowing the right questions to ask. Job-hunting is hard. We’re here to help. Call 333-4346 to set up an appointment with Kirstin Wilcox, Director of Internships. The holidays? They can be stressful, particularly when they give your family members opportunities to quiz you about your plans after graduation. Stay true to yourself. Spend time with a book you want to read but don’t HAVE to read to remind yourself why you got into this major in the first place. Write a poem. Watch a movie with some intellectual heft to it. Make a trip to the nearest independent or used bookstore. Save this link to your phone. The odds may or may not be ever in your favor, but the data certainly is, so you can be ready when a relative trots out some canard about English majors being unemployable. Need more talking points? Try this, this, or this. “Try to get experiences in as many areas as you can,” Reilly advised in her talk. Having a range of experiences will add diversity to your résumé and can make you stand out as an applicant. Reilly advocated that you try to gain specific experience in areas like writing and social media through involvement in student organizations, part-time jobs, and internships. Such concrete experiences can also give you opportunities to network with fellow students, campus employees, and alumni, which can help you to develop more connections and even to obtain future jobs. Humanities students acquire a wealth of soft skills (e.g., communication, leadership, critical thinking) that are applicable to most professional fields and are increasingly sought by employers. These skills are most valuable to you when you learn how to recognize them and narrate their applicability to potential careers. Reilly particularly emphasized flexibility (especially the ability to teach yourself new things), research skills, and evaluative skills as critical tools that humanities students develop. Because you routinely put these skills into practice in your humanities coursework, you may not realize how special they are. Learning to think about your everyday academic activities in the context of their applications outside of the classroom can help you to highlight your preparedness for a range of careers.